ATLANTA, March 5, 2018 — Two-thirds of Georgia’s third graders struggle to read at a third-grade reading level – and that is just the beginning of a difficult story for our state’s youth. Children who cannot read proficiently by the end of the third grade face an uphill battle, as they are more likely to experience poor health, discipline problems and unemployment, as well as being significantly more likely to become teen parents, drop out of school and spend time in prison. Concerned about the future of Georgia’s youngest minds, First Lady Deal launched the Read Across Georgia campaign in 2012 to tackle third-grade reading proficiency. Through Read Across Georgia the First Lady emphasizes to parents, older siblings and caregivers the importance of such simple activities as reading to younger children for a few minutes each day. As part of the campaign, she tours the state each year with one major goal in mind –to ensure that, by 2020, all children in Georgia will be on a path to reading proficiently by the end of third grade. This year, Get Georgia Reading is partnering with the Georgia Forestry Foundation and the Sustainable Forestry Initiative to celebrate a special Read Across Georgia theme. Intended to plant the seed of reading in the minds of young children, the 2018 Get Georgia Reading campaign hits especially close to home, as it highlights an industry crucial to the state’s success – forestry. Just like the two-thirds of students who are not reading at grade level, forests cover two-thirds of Georgia. As key supporters of one of Georgia’s most important resources, the Georgia Forestry Foundation and Sustainable Forestry Initiative want to connect children to the forest by helping them learn how to read. 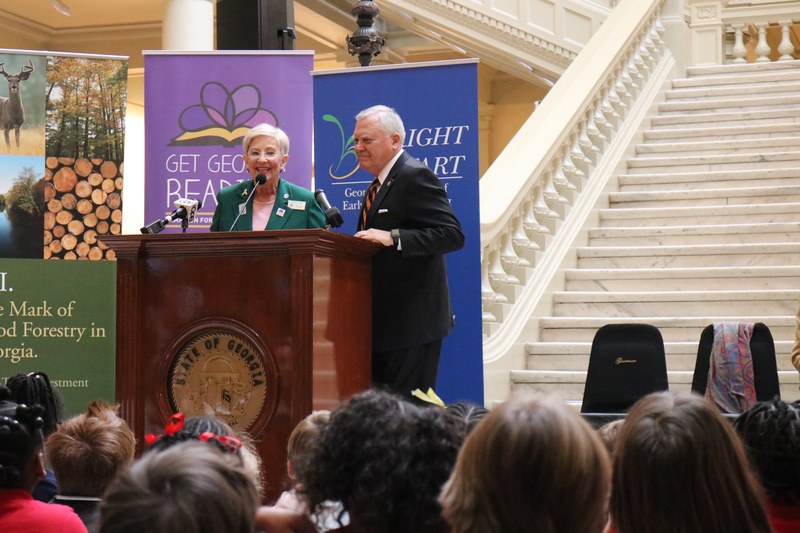 “We are so thankful for Governor and Mrs. Deal’s vision to have all of Georgia’s children reading on grade level by third grade. Together, organizations like Get Georgia Reading, the Georgia Forestry Foundation and the Sustainable Forestry Initiative can protect and empower Georgia’s greatest treasure – our children. We believe these partnerships lay groundwork for teaching Georgia’s children the life-giving properties of reading and the working forests throughout our state.”, said Ember Bishop Bentley, Executive Director, Georgia Forestry Foundation. This year, First Lady Sandra Deal will tour the state reading a homegrown children’s book, The Forever Tree, authored by Georgia’s own Carmen Agra Deedy and John McCutcheon, illustrated by Georgia illustrator Thomas Gonzalez and printed on Georgia-manufactured paper. First Lady Deal and the book’s co-authors gave children a sneak peak of the tree-filled tale at a Read Across Georgia Day celebration on March 5. Once the book hits bookshelves this fall, the Georgia Forestry Foundation will provide a copy of the book to every elementary school and public library in the state, as well as to afterschool programs and youth-focused community organizations, totaling 25,000 copies. Improving childhood literacy in Georgia is a challenging task, but one that can improve the lives of the more than 10 million people who call the state home.